They are the defending World Series champions, only they’re not. At least, they’re not the same guys we saw last October. Third baseman Mike Moustakas, left fielder Alex Gordon and catcher Sal Perez are in various states of disrepair. Their replacements include two 27-year-olds who recently made their major-league debuts, Whit Merrifield and Brett Eibner, a highly regarded third-base prospect, Cheslor Cuthbert, and oft-overlooked backup catcher Drew Butera. And somehow, the Royals are back in first place. Alas, Eibner suffered a left ankle lateral sprain Tuesday night and likely is headed to the disabled list. His early performance and Merrifield’s, in particular, evoke the Cardinals’ ability to plug and play seemingly anyone from their farm system. 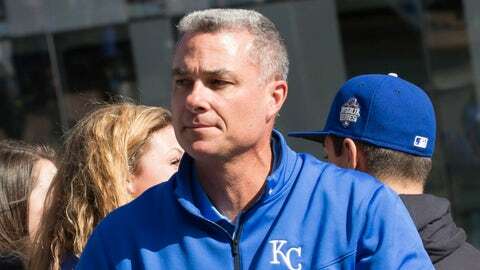 But as so often is the case with the Royals, the better comparison is to general manager Dayton Moore’s previous club, the Braves. Moore on Tuesday rattled off a list of former Braves whom the team could summon from the minors to contribute when necessary — Nick Green, Charles Thomas, Peter Orr, Ryan Langerhans. 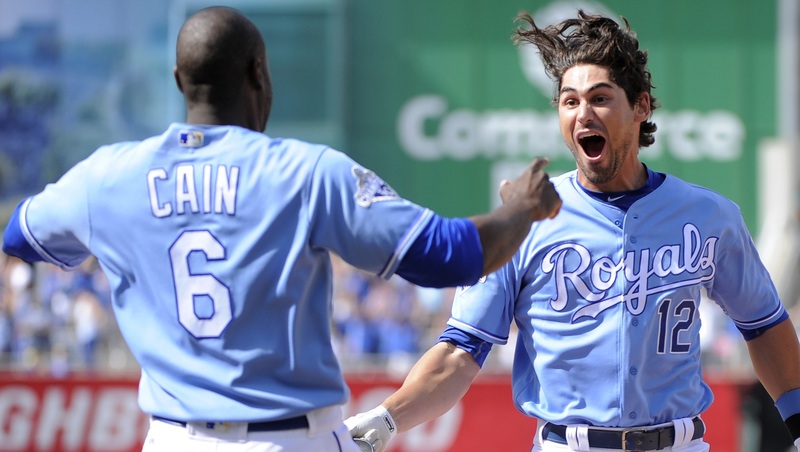 Merrifield, the Royals’ ninth-round pick in 2010, and Eibner, their second-rounder that year, are in the same mold — and come to think of it, so is Paulo Orlando, who emerged with the Royals last season. Both Merrifield and Eibner are too old to be considered prospects. But Merrifield has reached base in all of 10 of his starts, batting .356 with an .822 OPS. 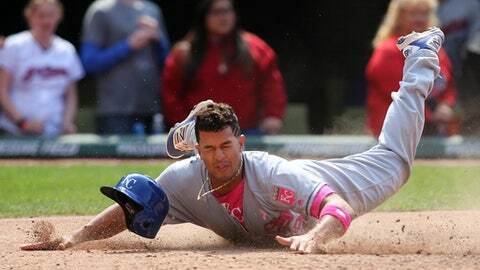 Eibner started the Royals’ comeback against the White Sox with a double on Friday, hit a walk-off single Saturday and produced two hits and a game-tying bases-loaded walk on Sunday. All told, he’s 6-for-13 with three doubles. “When you’re winning at the major-league level, there is less opportunity for players,” Moore explained. “They spend more time in the minor leagues, get more at-bats, continue to develop. They’re able to slow things down. “They know the opportunity will come at some point — that’s why they keep doing what they’re doing. Then, when the opportunity comes, they have more of a sense of urgency, but they’ve lived life a bit. They know what’s important. In some cases, they’re married with kids. They handle it better. Is it possible that the Royals will need to add outside help before the July 31 non-waiver deadline, particularly if Cuthbert fails to hit enough to hold down third base? Of course. But the Royals understandably want to protect the culture they’ve created and would prefer to stick with their internal options. When I spoke to Diamondbacks GM Dave Stewart last Friday, he was just about to place right-handers Shelby Miller and Rubby De La Rosa on the disabled list, where they would join outfielders A.J. Pollock and David Peralta. Stewart, though, was not about to make excuses. 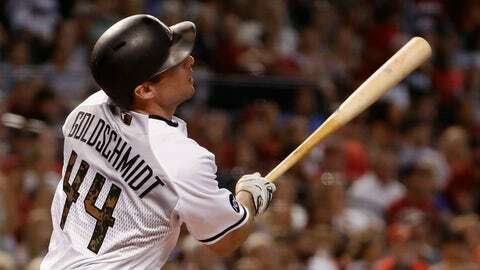 (Goldschmidt, as if on cue, since has gone 9-for-15 with two doubles, two homers and four walks since Friday). Stewart is correct — the D-backs, with their season one-third complete, are averaging more runs per game than they did a year ago, 4.57 to 4.44. But their ERA, after adding Miller and Zack Greinke, is nearly a run per nine innings worse, jumping from 4.04 to 4.86. The D-backs’ schedule has been a grind — the team, after already completing its one stretch of 20 consecutive games, is in the middle of its second stretch of 16 straight. If things do not improve in June, Stewart could explore trading potential free-agent relievers Brad Ziegler and Daniel Hudson, at the very least. Then again, the DBacks might be better off extending the two relievers — they are not operating on a one-year plan, and their farm system does not appear ready to provide bullpen help. The D-backs have used 23 pitchers this season, second in the majors only to the rebuilding Reds, but have yet to identify the right mix. In his latest show of might, Noah Syndergaard threw nine of his 17 pitches at 100 mph or higher in a blistering one-inning relief appearance for the Mets on Tuesday night. Syndergaard had thrown only 33 pitches before getting ejected three days before and is not scheduled to start again until Friday. Watching Syndergaard is a blast, but we’ve seen how pitching deep into the postseason affected his teammates, Matt Harvey and Jacob deGrom. Many in the industry believe that at some point this season Syndergaard will hit a wall as well. Syndergaard threw 65 2/3 more innings last season than he did the year before, an alarming jump by today’s standards. 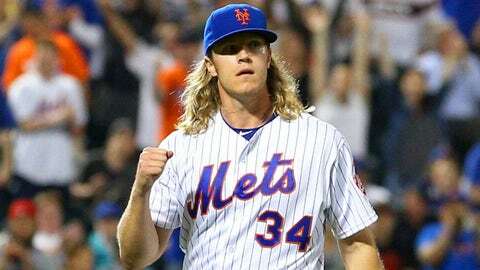 Mets GM Sandy Alderson said the Mets will be as mindful of Syndergaard’s workload as they are of their other starters’ and that the team eventually could employ some of the same strategies it did last season, including using a six-man rotation and skipping certain pitchers’ starts. The six-man rotation will become particularly viable once Zack Wheeler returns from Tommy John surgery in July — assuming all of the current starters remain healthy. Sometimes the best trades are the ones a team doesn’t make — and sometimes, darn it, a team should have just pulled the trigger. Case in point: The Padres, who could have landed right-hander Michael Fulmer as part of a package for outfielder Justin Upton at the non-waiver deadline last year. The Mets turned out to be better off, using Fulmer to acquire outfielder Yoenis Cespedes from the Tigers. The Padres gained the 24th pick in next week’s amateur draft after Upton rejected their qualifying offer and signed with the Tigers. 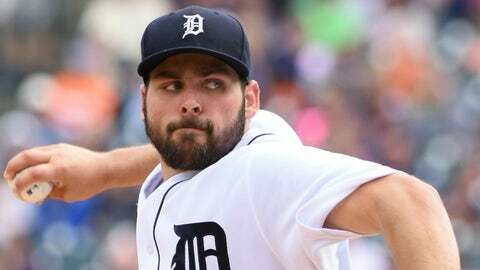 But wouldn’t they rather have Fulmer, who posted a 3.97 ERA in his first six major-league starts, averaging 9.53 strikeouts per nine innings? 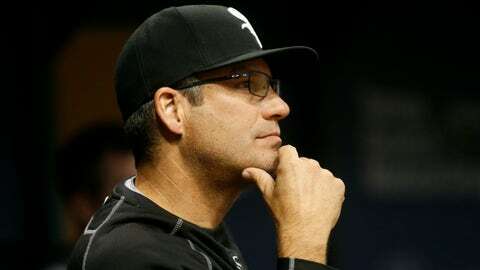 Nary a word was said about the White Sox firing Robin Ventura when the team was 23-10 with a six-game lead in the AL Central. If anything, Ventura drew credit for holding the team together through the Adam LaRoche crisis and guiding a new collection of players to an excellent start. The Sox since have gone 5-15, leading to renewed grumblings about Ventura, but it’s so much shouting in the wind. The time to dismiss Ventura would have been at the end of last season, when the team was coming off its third straight losing campaign. But Jerry Reinsdorf, perhaps the most loyal owner in sports, declined to make a change. At the time, GM Rick Hahn praised Ventura’s communication skills and handling of players, and those qualities surfaced again in the spring after the players erupted over LaRoche’s retirement. Still, this is the final year of Ventura’s contract. The White Sox never were as good as they looked, but a fall from contention might leave Reinsdorf and Hahn with little choice but to change managers, if not during the season, then certainly after. The road wanderings of the Rockies’ Double-A Hartford Yard Goats are hardly unprecedented for a minor-league team awaiting the completion of a new ballpark. The Yankees’ Triple A Scranton-Wilkes Barre affiliate played the entire 2012 season on the road, though it was based primarily in Rochester, N.Y. The Brewers’ Double-A Biloxi affiliate began last season with a 54-game road trip — and wound up being named Baseball America’s Minor League Team of the Year. The Yard Goats are doing a fair imitation of Biloxi, which won the Southern League’s first-half championship last season. The Goats, at 30-19, are in second place in the Eastern Division of the Eastern League, behind the Reading Fightin’ Phils. Rockies farm director Zach Wilson said the team had inside information on how to handle Hartford’s predicament — the owner of the Biloxi club, Ken Young, also owns the Rockies’ Triple-A Albuquerque affiliate, and the Albuquerque GM, John Traub, also was heavily involved with the Biloxi team at that time. Still, the Yard Goats face a mammoth task. Travel, laundry, helping players with their families — all present unique challenges for a team that plays no home games. The Hartford club, needing to carry extra equipment, rented a box truck to follow the team bus from city to city. Wilson said club officials met with players toward the end of spring training, when it became clear that the Hartford ballpark would not be complete, and told them to control what they could — their attitude, their professionalism, their work ethic and preparation. The Yard Goats have done that, even with the timetable of their ballpark’s completion still unclear. The team’s rotation is considered one of the best in the minors, and the club features several top position prospects, too. * The Nationals are expected to look for bullpen help and another bat before the deadline — preferably a left-handed hitter, given that first baseman Ryan Zimmerman and left fielder Jayson Werth both are right-handed. Zimmerman was much better in May than in April, but Werth actually was worse. 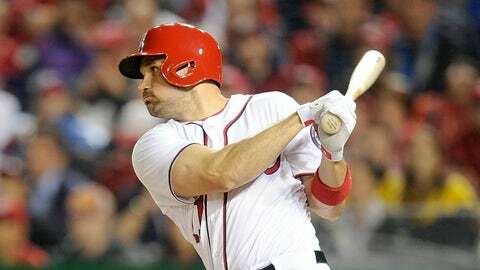 The Nationals, who have barely outscored the rebuilding Brewers, rank eighth in the NL, averaging 4.26 runs per game. *The Yankees remain excited about Triple-A catcher Gary Sanchez, who should return in a few weeks from a non-displaced fracture in his right thumb. Sanchez, 23, is one of the 20 youngest players in the International League (the Rays’ Daniel Robertson, Reds’ Jesse Winkler and Nationals’ Trea Turner, all 22, are the three youngest). It’s unlikely the Yankees would attempt to trade catcher Brian McCann if they had a shot at the postseason — and McCann has a full no-trade clause. But who knows what might happen this offseason? Sanchez remains seventh in the International League in OPS, and his exit velocity also was among the best in the league before he was injured. *Manager Dave Roberts cites the marine layer, but does that fully explain how the Dodgers hit much better on the road than they do at home? Five of their regulars — Justin Turner, Howie Kendrick, Yasiel Puig, Joc Pederson and Adrian Gonzalez — are batting .211 or below at Dodger Stadium; and Pederson is the only one in that group with a presentable OPS. The Dodgers are averaging 3.44 runs per game at home, 26th in the majors. On the road they’re averaging 5.11, which ranks fourth. 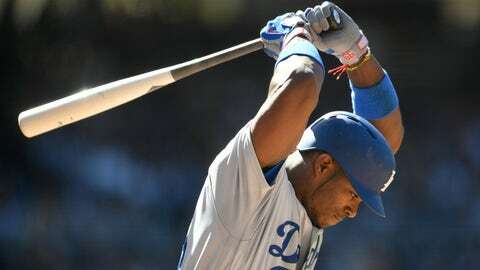 *Speaking of the Dodgers, Puig’s occasional mental lapses overshadow a far bigger issue — his sagging offense. Only the Rays’ Corey Dickerson and Rockies’ Carlos Gonzalez are chasing more curveballs and sliders out of the strike zone, according to STATS LLC, while Puig’s overall numbers — a .239 batting average and .650 OPS — are below-average for a right fielder. His baserunning actually rates as a plus, and defensively Puig is one of the game’s highest-rated right fielders, according to the advanced metrics. *Shortstop Alex Bregman leads the Double-A Texas League with a 1.059 OPS less than a year after the Astros made him the second overall pick in the amateur draft. So, might the team summon Bregman soon? Well, the Astros’ current shortstop, Carlos Correa, does not turn 22 until Sept. 22, making him nearly six months younger than Bregman. Third base could be an option – Bregman has started six games at that position this season – but probably not until later in the summer. The Astros rank 29th in OPS at third base. Only the Dodgers are worse.